FADEL was named one of 2016’s Top 30 Fastest Growing Companies by The Silicon Review. The publication’s latest issue features some of the most dynamic companiesthat have made significant contributions in the field of Business and Technology. “Technology like FADEL’s is critical to [technology innovators’] success and ability to manage and monetize new innovations effectively. We monitor companies like FADEL that demonstrate this domain influence as well as revenue growth, creativity in innovation and strong customer reviews,” said Sreshtha Banerjee, Managing Editor, The Silicon Review. 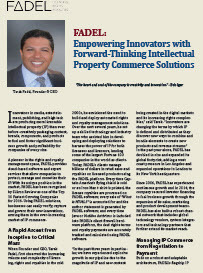 Innovators in media, entertainment, publishing, and high tech are producing more licensable intellectual property (IP) than ever before–creatively packaging content, brands, components, and products to fuel and foster significant business growth and profitability for companies of every size. For more information visit www.fadel.com or email us at solutions@fadel.com.